The Trio was forged out of a collective desire to draw new and diverse audiences by performing high energy, top quality music. Using social media to broaden their reach beyond the concert stage and classroom, the Trio has its own YouTube channel, which has over 77 million views and 85,000 subscribers, making PROJECT Trio one of the most watched instrumental ensembles on the internet. Highlights of the Trio’s 2013-14 season include engagements with the San Diego, Toronto, Kansas City, Lafayette and New World Symphony Orchestras, and a continued relationship as Family Artists in Residence with the Los Angeles Chamber Orchestra. This season, the Trio will perform and lead masterclasses in schools, universities, festivals and other venues throughout the United States. May 2013, the Trio completed a landmark tour of the former Soviet Union sponsored by the US Department of State. PROJECT Trio was featured on NPR’s Morning Edition and NPR Music’s series, Heavy Rotation, where hosts around the country share a favorite new song. They selected Sweet Pea, from PROJECT’s 2012 Random Roads Collection album, as “one of the best new tunes out there.” In addition to TV and live radio appearances on such programs as Soundcheck on New York’s WNYC, and Sirius XM among others, their music can be heard in Nike and Smart Car commercials. Greg Pattillo recently demonstrated his beatbox style for Jay Leno and performed with the Tonight Show orchestra. The members compose and arrange all of their own music, which they publish on their Harmonyville label. Their repertoire includes pieces for trio as well as several works with orchestra. With a goal to further expand the repertoire for their unique combination of flute, cello and bass, the Trio is collaborating with composer Adam Schoenberg on a concerto commissioning project for the 2015/16 and 2016/17 seasons and launched the PROJECT Trio Composition Competition. The Trio is dedicated to arts education, teaching the art and joy of jamming on classical instruments and opening minds to what instruments can do. Engaging younger audiences, PROJECT Trio has performed and led workshops for over 150,000 students on four continents and is instantly recognizable to students of all ages as a result of their YouTube following and appearances on popular TV shows on Nickelodeon and MTV. With specialized curricula for age groups from elementary students through college, their educational programs are adapted to meet the National Standards for Music Education. Taking note of the group’s success in building new audiences, Chamber Music America has invited the members to make a presentation on successful audience engagement techniques for the 21st Century at the January 2014 CMA conference in New York City. In the summer, the group runs a camp focusing on improvisation and chamber music. The camp has been held in New York City and Michigan. Based in Brooklyn, New York, Pattillo, Stephenson, and Seymour met at the Cleveland Institute of Music, where they were honored with the 2013 CIM Alumni Achievement Award. Founded in Boulder, Colorado in the summer of 2005, the Trio got its big break in 2006 when Greg Pattillo’s Beatbox Flute video went viral on YouTube, receiving millions of views in its first week. 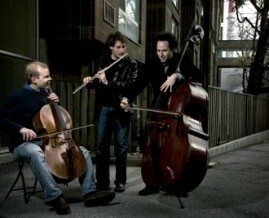 PROJECT Trio has since become one of the world’s most exciting instrumental ensembles.